Pedersen, Anne-marie and John Pritchard. "Haisla (Kitamaat)". The Canadian Encyclopedia, 16 October 2018, Historica Canada. 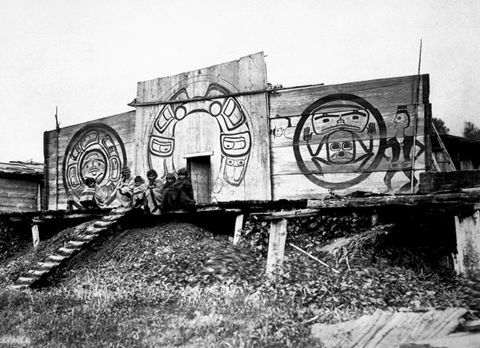 https://www.thecanadianencyclopedia.ca/en/article/haisla-kitamaat. Accessed 21 April 2019. The contemporary Haisla Band is an amalgamation of two bands, the Kitamaat of upper Douglas Channel and Devastation Channel and the Kitlope of upper Princess Royal Channel and Gardner Canal in BC. The contemporary Haisla Band is an amalgamation of 2 bands, the Kitamaat of upper Douglas Channel and Devastation Channel and the Kitlope of upper Princess Royal Channel and Gardner Canal in BC. The Kitamaat call themselves Haisla ("dwellers downriver"); and the Kitlope Henaaksiala ("dying off slowly"), a reference to their traditional longevity. The official designations Kitamaat ("people of the snow") and Kitlope ("people of the rocks") were adopted from the names used by their Tsimshian neighbours. The Haisla language is the northernmost of the North Wakashan division of the Wakashan language, and one of the six language families within the Northwest Coast Language Families which is closely related to Kwak'wala and Heiltsuk. Unlike those of other Wakashan-speaking nations, the Kitamaat and Kitlope social system was based on the matrilineal clan. This principle was also followed by the Tsimshian bands, with whom the Haisla enjoyed close economic and social relations. 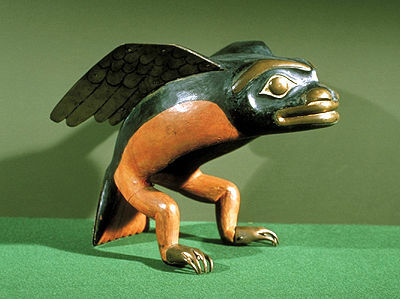 Originally there were eight clans (Eagle, Beaver, Raven, Crow, Killer Whale, Salmon, Wolf and Frog), each composed of family units or lineages, occupying one or more communal dwellings that housed up to 30 individuals. The highest-ranking members of each house or lineage formed a council of nobles for the clan chief, who himself acted as counsellor to the nation chief. Each clan controlled its own resource sites within the general traditional territory, and each occupied an independent winter village. No formal estimates of precontact population exist, although Aboriginal tradition asserts that each nation numbered about 1000. Epidemics and endemic diseases brought by Europeans reduced that population, and after the 1918 influenza pandemic, fewer than 300 survived. The decline slowed around 1930; by 1986 the population of the combined bands had reached 1100 and by 1996 the Kitamaat population was 1364 (figures for the Kitlope were not available). Population estimates are also difficult due to additional persons of Haisla ancestry who lost their status (see Indian Act). With the population decline, the Wolf and Frog clans disappeared entirely. The survivors of other clans formed linkages in which they united to occupy a common winter village and co-operated economically and socially, as in the planning and amassing of wealth for the potlatch. Eventually the whole nation began to occupy the same village, although clan distinctions and linkages remain. Missionaries and government agents believed that the flamboyant, theatrical aspects of traditional Aboriginal culture were impediments to "civilization" and should be eradicated. They exerted pressure to abandon feasts, dancing and potlatches; the traditional communal houses were pulled down, and the children were forbidden to speak the Aboriginal language. In 1884 the potlatch was banned by the federal government and was not reinstated until 1951. During the same period, the decline in population shattered the clans and lineages and disrupted orderly lines of succession to titles and property in the traditional social order. The remoteness of some villages, situated far up northern inlets, enforced isolation on the Kitimaat and Kitlope until the 1890s, when a mission and residential school were established at Kitamat. After several decades of strain and dislocation, a culture has emerged that combines elements of both their traditional heritage and Euro-Canadian culture. The non-profit Na Na Kila Institute was established to support the conservation, stewardship and development of the ancestral lands and culture of the Haisla Nation. In 2006 the Na Na Kila Institute facilitated the repatriation of a Haisla totem pole which was the first pole ever repatriated from overseas. 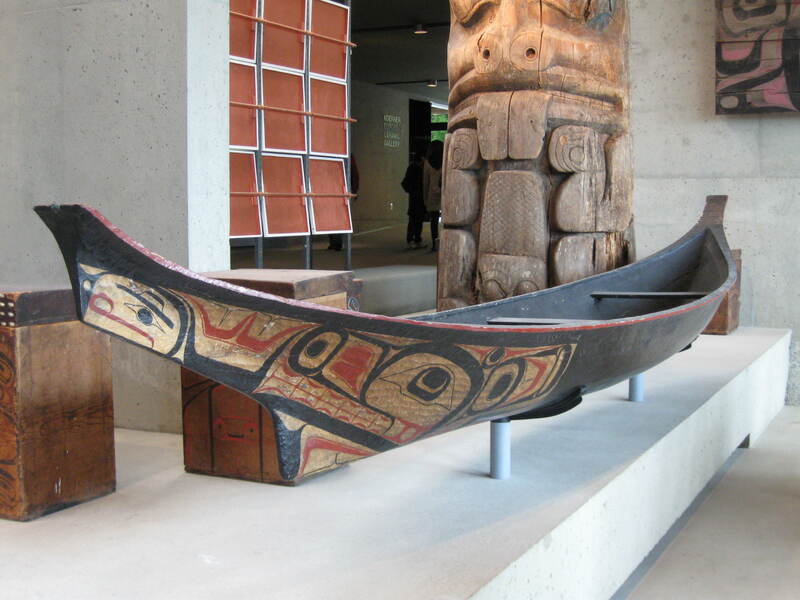 The pole was returned to Canada from the Museum of Ethnography in Stockholm to the UBC Museum of Anthropology in Vancouver. In 1876 Chief G'psgolox erected the totem to commemorate the Kitlope people who died during the smallpox epidemic. In 1929, the traditional mortuary pole, G'psgolox, was removed from a Haisla village in Mis'kusa and was missing for over sixty years; however its memory was retained in the Haisla oral traditions. In 1991 the pole was discovered in Sweden and after years of negotiations, and 77 years in a foreign museum, the pole was returned to Kitamaat, BC, on 1 July 2006, and a second pole was erected in Misk'usa, where the original pole was located. As part of the repatriation agreement, the Haisla carved a replica pole for the Swedish museum. The loss of the totem pole, its discovery and its repatriation were documented in the film Totem: The Return of the G'psgolox Pole, by Gil Gil Cardinal for the National Film Board. See also Aboriginal People: Northwest Coast and general articles under Aboriginal People. R. Olson, "The Social Organization of the Haisla of BC," Anthropological Records 2, no 5 (1940).